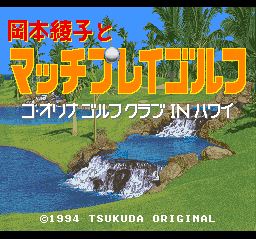 Ayako Okamoto and the Match Play Golf: Ko Olina Golf Club in Hawaii is a SNES golf game. You are playing as Ayako Okamoto and you are a golfer, like Battle Golfer Yui. This will kick golf ball into the hole to get you a topscore. This game was never released in outside Japan.